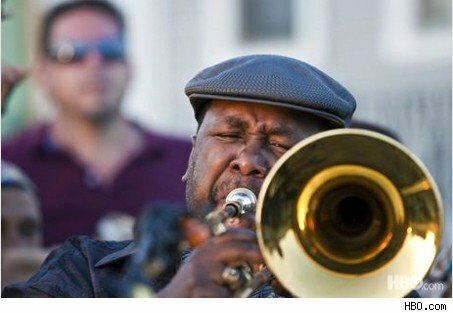 THUD: Treme is coming back! This show: Does Not Blow. Treme is not for everyone but it’s certainly for me. Anyone who likes complex storylines, amazing music, great performances, and a dose of anti establishment opinion can’t go wrong. David Simon’s New Orleans show isn’t The Wire but it’s damn good and Wendell Pierce (above) is fast becoming one of my favorite actors. Period. I can watch him all day long. Clarke Peters and Steve Zahn are great too… but where Peters was my favorite character on Simon’s seminal cop show Pierce is the heart and hangdog soul of Treme. It’s a commitment and not an “easy” show to just watch for hollow entertainment but it’s as close to a novel as anything current television is offering and it thrills me that HBO just picked it up for a third season. When the network picked the show up right after the first episode aired last year I was elated. Then the ratings dropped. I would have bet my limited resources that we’d never see a season three. This season the numbers aren’t great but HBO seems to be making a point not to replicate past mistakes. With Treme, Boardwalk Empire, and Game of Thrones in for a long haul I am pretty much assured to be a subscriber for the duration as well. To me that’s the best and most direct way of voting with your dollars television allows. HBO had a rough patch. That rough patch is OVER.